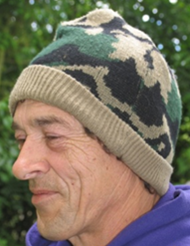 Barry's 2013 Blog, click below. Blog 2013 - Deep Water Winter Eel Trips & Summer Zander in river and canal. My bivvy has been away for repair and I was pleased to get it back today. It is an Aqua Carbon Compact. 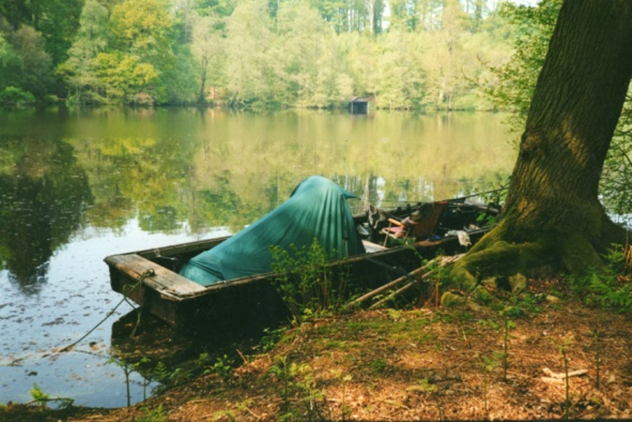 What I like about this bivvy is the size – it leaves a minimal footprint on the bank and the fact that it has just two ribs that are a two break pole system making it simple to erect and disassemble and it breaks downinto straight lengths that lie flat and can be stored in a rod holdall - simplicity itself perfect. Pete Drabble waited to see if the carbon compact would stand 12 months of hard wear and tear on the bank with me before he bought one. After a year of continual use my Carbon Compact was still like new so he went and bought one. Mine broke the following week. It was probably my fault. It was a frosty morning and the material was stiff and tight. With cold hands I pulled the elasticated poles apart and broke it down – literally – I snapped the carbon rodnear the ferrule. A telephone call to Aqua found me talking to a helpful and agreeable member of staff who sent me a replacement front carbon rod in the post. It arrived the following day and after only one session under my backup brolly and overwrap I was back in the bivvy. Two weeks later as I assembled the bivvy and pulled across the tension strap– snap!– The rear carbon rod broke and it may have been my fault again. I had the bivvy off the ground, a fag in my gob and smoke in my eyes as I yanked the tension strap across and hooped it over, mid-air. I think you are supposed to lay the bivvy flat on the ground and slowly, carefully pull the tension strap acrossin an orderly fashion. This time the helpful man from Aqua wanted to check my bivvy over to see if there was a reason forthe rods breaking when really it was my recklessness that needed checking. Meanwhile I was back under the brolly and overwrap while the thing was recalled, repaired and returned. Hopefully, I will learn from the experience of my recklessness and in future I will assemble and disassemble more carefully and slowly and everything should be ok in future. Spiders, One of the most pleasing aspects of this bivvy design is to find that its shape and compactness of the interior harbours less spiders and insects than the umbrella and overwrap I have been under which was a perfect lair for insects and especially spiders. I have often wondered how to stop spiders in the bivvy as they are attracted to the open door space where they will spin their web across so their gossamer thread gets in your eyes.On the fens in winter the little, black money-spiders lay their webs across the top of the short grass and live in the cavity beneath. They love a bivvy and I used to get so many that at times if you knocked the side of the bivvy at night, lots of money spiders would drop down on their threads. It’s not so much the spiders but their threads that bother me, getting in my eyes. I have often wondered about making a spider trap to go in the bivvy. All I found on the internet was in the USA they use sticky paper, like fly paper. I tried it but it wasn’t very good. Maybe a trap like a mini lobster pot would work. I know that spiders will squeeze into small holes because I used to remove a spider from each of my old micron fox alarms each morning where they had crawled into the speaker hole on the front. It seemed to appeal to them like a nesting box to a bird and the spider was always as large as the hole would allow – so you could have different sized holes for different sized spiders.I once read an advert for some anti-spider spray in one of these new-inventions and gardening gadgets brochures. I bought some of the pet friendly potion - a liquid concoction of herbs that will deter spiders – and I sprayed the stuff on my bivvy interior, once, as advertised in the brochure. It formed big bleached stained patches and the entire bivvy was spattered with mouldy blotches and it had a nauseous smell that lingered for months by which time the stuff had rotted through the bivvy on the bleached stains. That was a pre-96 Nash Titan which was a nice small compact bivvy. Ever since then the bivvy design has got bigger – all ‘Eurocrazed’ and ‘Vipered out’ - and until I got this compact I couldn’t find one small enough so I am pleased to have got a compact that I can squeeze into tight swims. 30th May, 31st May & 1st June. 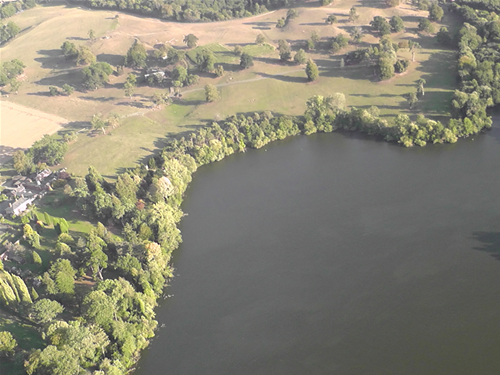 I booked two swims on a small mere of about 4 acres – one for me and one for Pete. I used to fish this mere from a boat but these days there is limited bank fishing allowed. It is a very hard water and I have only ever caught 4 eels there. I barrowed the gear across fields and through a wood and was settled in by lunchtime.The mere was alive with spawning carpand many of these had come from an adjoining larger mere to spawn in these sheltered sun-warmedwaters. This was perfect timing as we hoped that eels would home in on the spawning site for a good feed. Pete arrived in the evening and was still settling in as it went dark. On this mere it is best to fish in the shallow areas around the edge where the bottom is hard. If you have to unplug the leger you’re in the silt and in this mere that isn’t where you want the bait.The best time is the morning an hour or two after it gets light. The mere is surrounded by large trees and the leaf-fall has settled into deeper water where there is a loose layer comprising of several feet of mulchy leaf-mould silt. The pool is round with steep sides and the deep water in the middle acts as a big silt-sump. There is no oxygen in this deep area and the baits must be positioned in the shallow water around the edges where the bottom is firmer. We blanked the first night of the session and then on the second night the unexpected happened Pete caught an eel weighing 4lb 12oz at 6.00am. He said it was a fast run on deadbait and the eel ran into the silt so that he had to prise it out causing bubbles to streak the surface. When we came to do the photos Pete held the eel upside down which calmed the eel, then he flipped it over and I took a quick snap while it was still calmed. 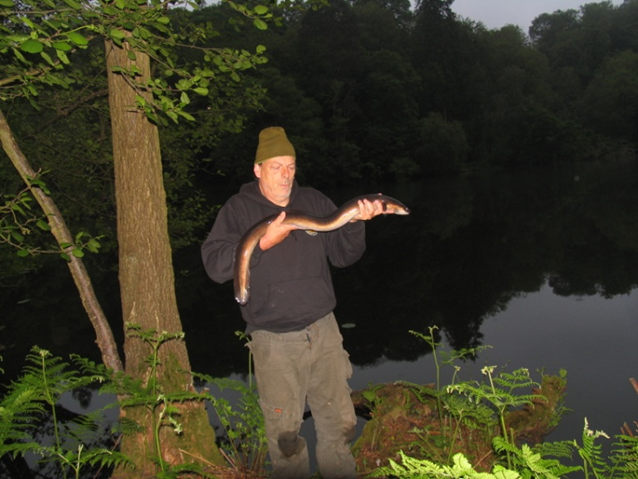 On the third night, it happened again, Pete landed another eel at 3.00am on a head section of a bream/roach hybrid positioned just one rod-length from the shore. The eel weighed 4lb 2oz. The session was a major success. Congratulations to Pete on catching two eels from a very hard water. It will always be a hard water and I don’t think we have cracked it but I will be going back. 2nd June 2012. The following night I did a session on another mere,a bigger water, and caught a 7lb pike, a 6lb tench, then a few perch in the morning but no eels! 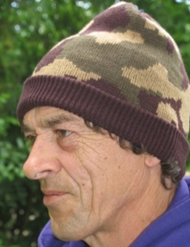 3rd – 7th June 2012. I went back to the small mere the following dayand set up in the swim where Pete had caught the two 4’s.The carp had finished spawning. 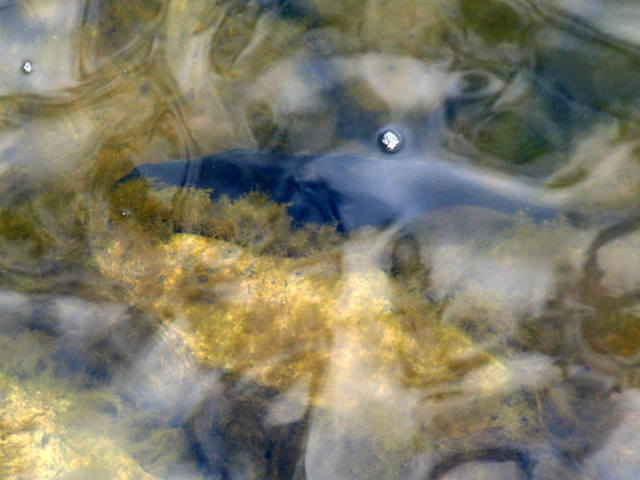 It rained constantly and the mere was quiet with no signs of fish except for a spawning casualty. I spent five days and nights at the venue but got no runs, which is probably what I expected from this moody and difficult water. 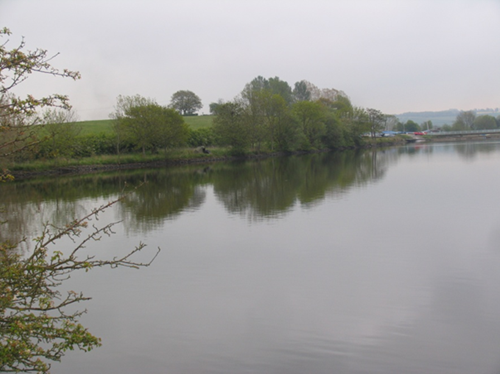 I had fished this swim from a boat many years ago and I now realised that when I used to fish from the boat it was moored over the hard bottom and once the rods were projected over the edge of the boat and the baits swung out underarm, they were in the silt. There used to be snags on either side of the boat so we could only cast outwards into the open water. I now realise that I was never fishing to full efficiency from the boat and if they made the venue boat-fishing only once again I would not be so keen. At night the wind dropped and the woodlands were still. It wasn’t silent though because there was one heck of a loud humming noise to be heard. It wasn’t the high pitched buzz of mosquitoes that is normally heard in these woodlands so I went to investigate and tracked it down to a hornets nest in a hollow tree that was riddled with woodpecker holes. 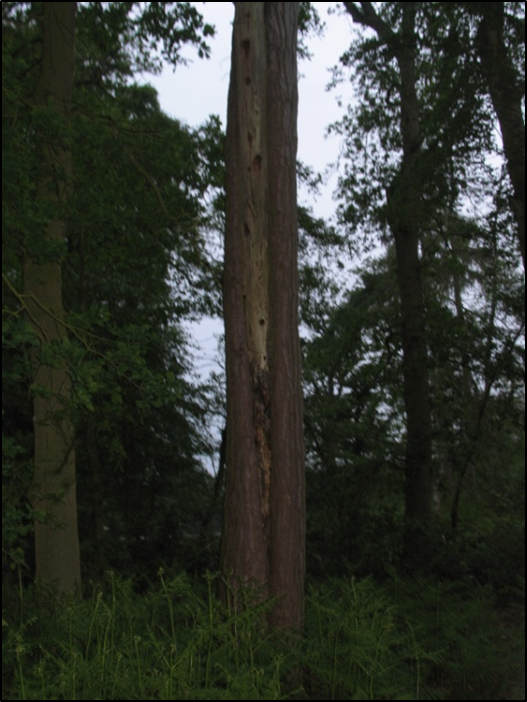 The hollow tree acted like an amplifier and the holes were the speakers that emitted the deep droning noise. The noise came from a humming tree that houses a hornet’s nest. I went into Total Angling at Shrewsbury and Dean said he could get me a go at a carp syndicate, Berth pool he said it holds some big eels. Then he said “I can remember seeing all the fyke nets lined up in rows when they netted it many years ago so it must have big eels.” Now that put me off as I avoid waters that have been fyke netted. 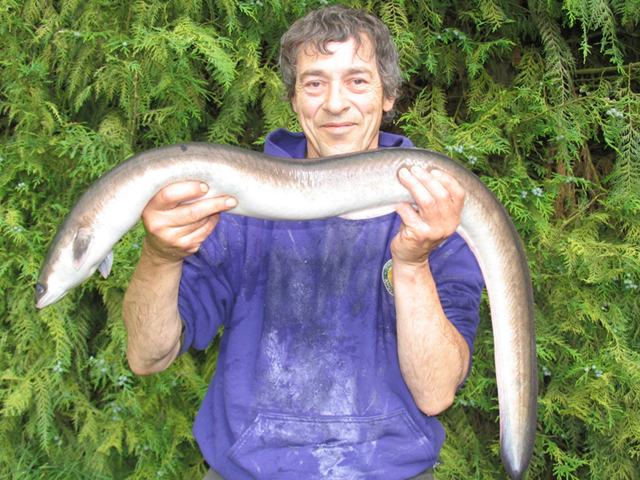 One of the other lads in the shop told me that an eel had been landed at Spring Lea last week weighing 6lb 9oz…..‘Hmm …. I better take a look’ I thought as my mind went into overdrive dreaming that I had found a commercial with huge eels in. I had better not pass this one by; I have made that mistake before with Docklow pools. 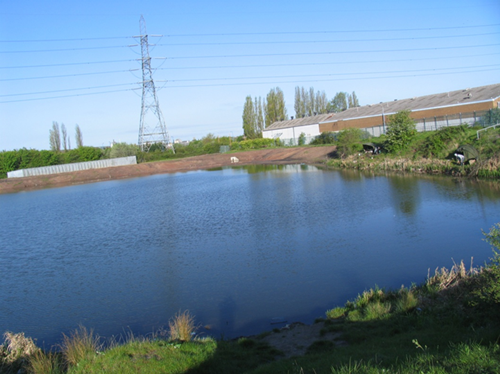 Many years ago I used to deliver worms to Middleton Angling centre in Manchester and John, the shop manager used to tell me about his mate’s commercial fishery Docklow pools. He was full of stories about giant eels and catfish. “Three big eels of about 10lb live in a sunken boat in one pool and then wriggle over the lawn at night to get to the match lake.” It sounded too far-fetched to me as I hear a lot of exaggerated eel stories so although I promised John I would take a look I was busy at another water and never bothered to go. 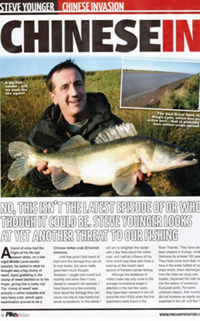 A few weeks later I saw Des Taylor and Nige Williams in the angling weeklies with 6 and 7lb eels from Docklow pool. June 9th 2012. A night on the big mere and as expected I didn’t get as much as a bleep on the alarms. Four other anglers were night fishing for other species and they got no runs either. It was as though there were no fish in the mere. Then the sun got up and fish started blowing in the sun-warmed shallows. The sun got higher and the fish moved round. The wind was blowing straight down the lake and green algae started to gather in front of me. There was a swirl by the rod tip and something swam into the line. The swirl parted the layer of algae coating the surface and I realised that it was dark beneath the algae which had provided cover for the fish to come close in. It would seem a good idea to fish beneath this stuff but when the layer is extensive there is no oxygen beneath; I know this because I once had an eel in a sack and while I was asleep the algae formed a layer over the entire bay I was fishing which soon depleted the oxygen and the eel drowned in the sack. There is so much natural food in this mere that it is difficult to get a fish to take the bait which is like a needle in a haystack. Apart from pike and perch very few fish have been caught since this water recently opened to bank fishing. Fishing here for any species is a challenge, the unknown and not at all easy. It has the potential to do a monster eel but for some reason all the eels we have caught so far have been small. Surely with all those acres of rich food larders there are to be some bigger ones. 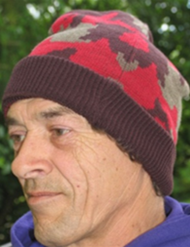 Or has the gamekeeper or estate staff fyke netted it… I wonder….quite how I would find this out is tricky because they probably wouldn’t admit it or it may have been done illegally. Such thoughts have crossed my mind as I have done endless blanks at this venue. 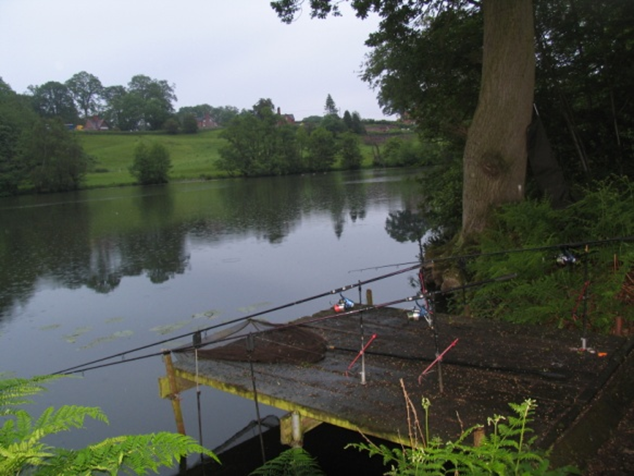 “Spring Lea is a series of five pools, offering great day ticket coarse fishing. 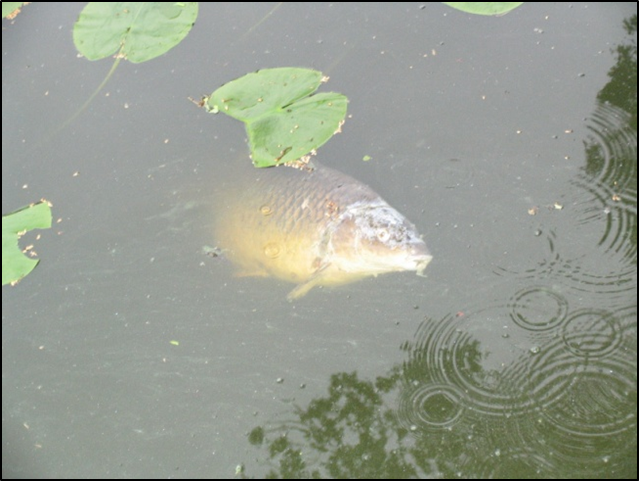 The pools are well stocked with hard fighting carp and a wide range of other species. 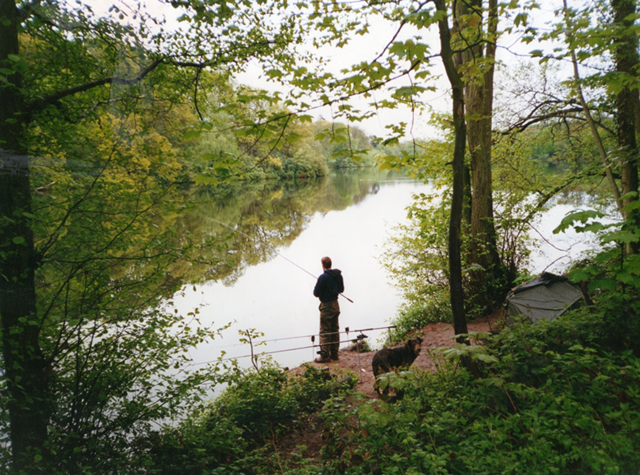 This offers a range of angling to suit everyone from the experienced angler, who can set their sights on one of the 20lb plus carp, to beginners, children and those who are returning to angling after some years away. Richard Lawson in August 2010. 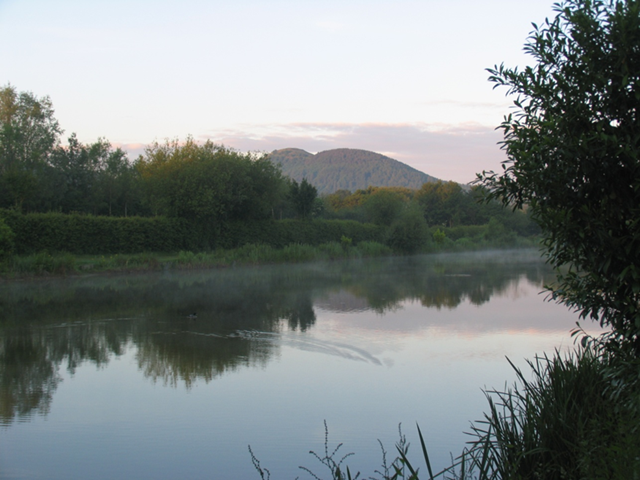 Spring Lea is located 6 miles south west of Shrewsbury, between the villages of Hanwood and Pontesbury, in the beautiful Shropshire countryside, offering lovely views of the Shropshire hills. Weekly open matches are held at Spring Lea and the pools can also be booked for club matches, but at least one (and usually more) of the pools is always open for pleasure anglers. Spring Lea - Kingfisher Lake. There are 5 pools at this venue and the one where most eels have been reported is Kingfisher which is the oldest pool because it was formed around an original pool on the site. In the late evening I caught two eels on deadbait sections – 1lb and 2lb then I missed three runs and decided it was booted up. Julian, the fishery owner came along and told me that the eel that had been caught in the match last week weighed 4lb 6oz and wasn’t a six which was the story relayed to me.This eel is the venue record and it was caught in the match pool Mallard, the next one up the system. This pool has less eels in and gets heavily match fished and heavily baited. I thought about all this and then moved onto Mallard Pool at 9.30pm. I caught a 2.01 and a 2.06 that night followed by a 3.10 at dawn (4.00am). I used ½ roach sections fished on the bottom. They were all healthy-looking, very fat, well-fed, strong-fighting eels and I thought it worth fishing again to see if I could get a 4lber. Another fact about this catch was that I had four rods out; three with 12lb Pro Gold and the other had the lucky pink line on. The smallest eel came to the Pro Gold and the other two came on the lucky pink line. This strange occurrence keeps happening. I caught one roach in the night and two perch at dawn. The mere was quiet. Not an eel in sight. June 12th & 13th 2012 - Spring Lea – Mallard. I took along a giant keep-net and planned to fill it with 2 and 3lb eels to show the fishery owner what was in the lake. I caught a 3.01 at 11.20pm as soon as it was dark. At 11.40pm I got a run on a roach tail section and hooked an eel just ½ a rod length out. It powered off. I had the anti-reverse on and the eel soon reached the end of its short leash. I thought I would hold tight and stop the eel in its tracks but as the rod bent I suddenly realised that this was a heavy fish and I needed to give some line. I reached to knock off the anti-reverse and as I did so the eel stood on the bottom in 18 inches of water, thrust forwards and managed to leap into the bankside reeds. I managed to drag it out of the thicket and back into open water. The angry eel then used its weight to bend, bend, and bend the rod as it headed for deeper water. 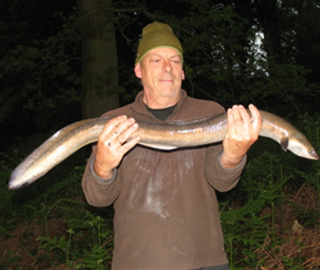 I kept my head and managed to encourage the eel into the net and was amazed to find it weighed 7lb 11oz and was 46” length with a 10 ½ inch girth. And, yes, it was on the pink line, of course! Pete usually comes to photo big eels for me and he arrived the next day. He has photographed more big eels than anyone and his photos are so much better than my ‘self-takes’. Most of the photos in the book I have written have been taken by Pete. Getting a passing member of the public or a nearby angler to take a photo is risky, it nearly always goes wrong. The following night I caught eels of 2.02, 3.06 and 4lb 9oz all on small perch that I cut in half. “I know Baz, the eels are bigger down here and so are the people” he said referring to his middle age spread that the NAC lads rib him over. I was still laughing at Steve’s answer when he passed me back to Duffy. “Well Baz are you going eel fishing or zander?” asked Nick. “Zander” was my reply but I still wanted to do both. I had planned to do my first ever summer of zander fishing and carry on through autumn but the eel bug is set deep and when it comes to the crunch I can’t miss a summer of eeling. In the end I ditched the zander and went off with my eel kit. Texts came from Rob, Alan and then Graham. Whereabouts are you on the Severn? On the way to Spring Lea I crossed the Severn at Shrewsbury where I could see the levels looked absolutely right and the river looked perfect. I cursed Lee for phoning with false flood alerts……I was going eel fishing and still wishing I was zedding on the Severn. I paid for 7 nights and settled on Mallard pool where I got no runs. The water was cold and baitfish were cold to the touch. There was a match on Mallard pool in the afternoon so I went on to Kingfisher. I caught seven eels on deadbait sections – three ones, three 2’s and a 3lb 6oz. I was catching these eels from very shallow water less than two feet deep and the 3.06 leapt clear of the water as it bolted when I struck which was something that I had never seen before. I moved at 5.40am to another pool. Two matches on Mallard today, one in the morning and one in the afternoon. I started on Orfe for the day and moved to Mallard at 11.30pm. Pete stayed on Orfeand got no runs. I moved to Mallard and got no runs either. It had been overcast and raining and the water was cold. June 18th, 19th & 20th – Mallard Pool. At last the sun beat down on the water and warms it for a few hours. 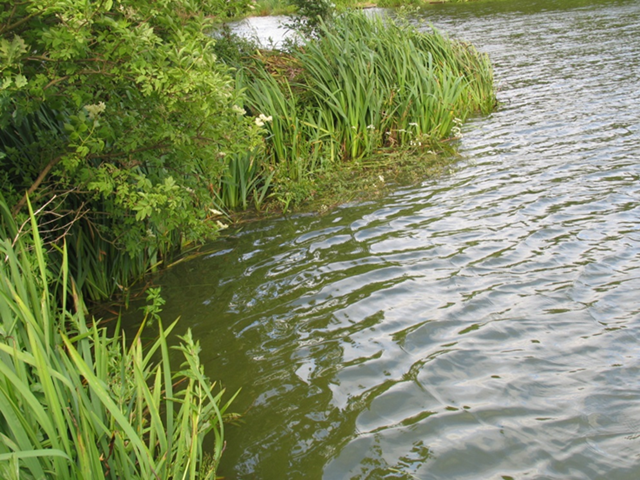 At 3.30 that afternoon I caught a 2lb 10oz eel on ½ a gudgeon. It was oozing excrement of pure semi-digested pellets out while it was on the unhooking mat. 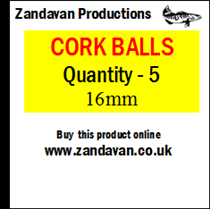 The fishery is heavily fed with these pellets which anglers buy on-site and no other type of pellet is permitted. They seem to work well as an eel fattener. At 6.35pm I caught a 1.08 on a dead perch and then at 9.45 pm as the light was fading after sunset …. It happened. 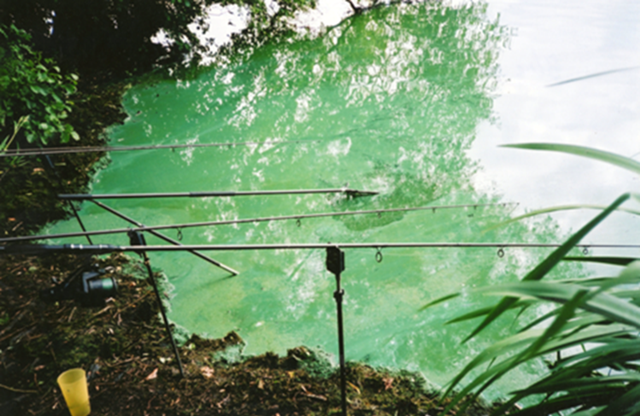 Pete had just been round for a brew and he had commented on the tree roots in the corner next to my rods. “I can just imagine a monster eel hiding in that lot” he said. As soon as he had gone I placed a bait near the tree. It had only been there about 15 minutes when the very lightly set rollover lifted halfway up and stopped, then it moved another few inches and rolled off but no line was taken. I tightened down, felt something pulsing on the line and struck. I realised it was a good eel straight away and reached for the landing net to put it ready in the water as I did so the eel shot out into the lake I quickly undid the anti-reverse and had to give line or it would have smashed me. It felt huge and the next run had me back-winding once again as the eel moved to the middle of the lake. I managed to gain control and tightened in to the eel to engage in a tug of war and see if I could get it back to the near bank – then the line fell slack. The hook had pulled out. I re-spooled with 16lb line as the 12lb stuff had been a bit risky for such an eel even though there are no snags or deeps. How big was this eel? I don’t know but it sure as hell took line and that’s not happened to me before in this country. I got no runs that night. The following night was a blank too. The carp were spawning in my swim and line bites were rather regular. I resorted to float-fishing which is the only way to reduce the incidence and even then carp were crashing into the float. I have done a lot of fishing amongst spawning carp and tried back-leads to pin the line to the bottom and floats to relay it over the surface but none work efficiently enough and I find the float is best. I still have a front-end alarm, open bail arm and the Rollover set so lightly that the weight bearing on the line is just about zero. At 4.30am I missed an eel run in the near margin. I know it was an eel because as I struck the eel jumped out of the water and its tail slapped the surface. I recast to the same spot and, as is often the case, the eel was back on the bait straight away. Once again I missed the run, so, before recasting, I trimmed the huge gudgeon down in size so the eel could manage it more easily but I got no more runs. June 21st The shortest night of the year. There was a match on Mallard pool so I nipped home during in the day. I went to look at a cased zander that someone was offering for sale. 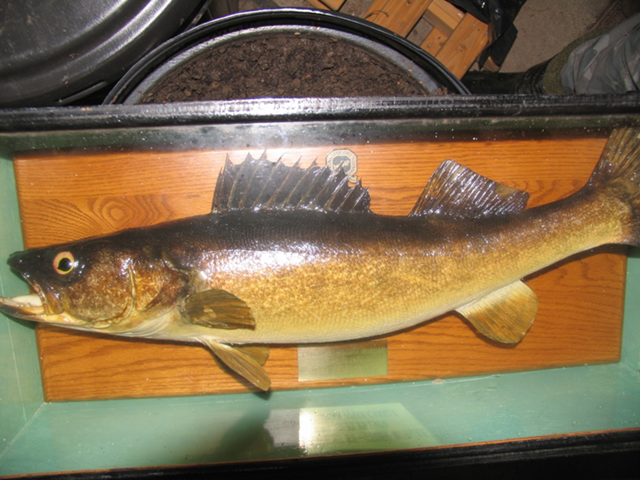 It was from Canada and I informed the chap that it was a Walleye, a cousin of the zander. I bought it anyway to go with the cased eel I own. Next I had to deal with the backlog of post, emails and forums that has built up over the last 6 nights. The cased fish I bought was a walleye not a zander. I was back on Mallard pool at 9.00pm and it was raining heavily. I squeezed the bivvy between two puddles, swished some baits and cast out 4 rods - two in the near margin, one in the far margin and one in the middle.I got several line bites which is normal here as it’s so heavily stocked with carp but otherwise it was a quiet night. It was quite light by 3.30am and at 3.50 am I got a run on a half roach in the middle of the lake and landed a 4lb 6oz eel. It was quite green with a very fat white belly and it didn’t look very old. I would love to be able to find out the age of the eels in this pool. I think the growth rate would prove to be astonishing. Run-rings. Ceramic run-rings are too expensive and sometimes snap under pressure. Soft plastic leger rings are too expensive and the plastic is too soft and tends to groove under the pressure of casting heavier rigs. 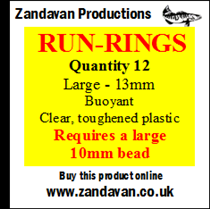 I use large 13 mm toughened clear plastic run-rings. They float and are almost as good as, but much cheaper than, ceramic run rings. 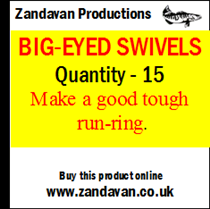 Big-eyed swivels also make good tough run rings for long range and heavy duty work. I use them with the JS rig but never (anymore) with the Dyson because the eel can wrap the wire around the swivel and snap the wire. It happened to me. 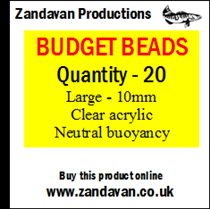 I use an assortment of beads with the correct diameter hole so the bead remains free running and won’t jam around the knot which could spook the eel. I have never paid for fancy beads that catch the angler but not the fish. A bead, is a bead, is a bead! 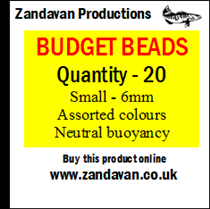 I ordered some more beads and swivels and more camouflaged hats in 4 different colours. Everything seems to come from china these days and it can take ages to arrive. I counted and packed the bits into individual bags as I am preparing for the PAC convention at Harrogate in September where I have a pitch selling rollovers, 999 alarms rig bits and the new book. The price for the bits is £1.50 per bag. 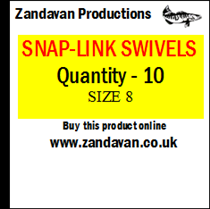 The hats are £5.99 each posted but buy with any other Zandavan item and you save £1. 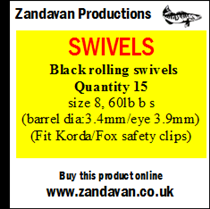 The range will also be added to Zandavan Productions website. I got a text message around midnight. Luke the carpet fitter had just landed a 40lb catfish, one of two fish that live in Tudor Griffith gravel pits on dyson rigged lobworms. He thanked me for the worms and the rig bits. I headed for the River Severn south of Worcester. Rain, rain, rain. There were flood warnings all over the north but the midlands seemed to be less flooded. I arrived at the river to find the levels high and no anglers in sight ….I wonder why?I caught a zander of about 7lb at 6.15 pm then I got eeled-out after dark and only landed one boot of about 1lb while suffering umpteen missed runs and shredded baits. Eels are the enemy tonight, darned nuisance fish. The river had risen about another foot by midnight and each time I looked out of the bivvy the water seemed closer, bigger, wider and scarier. By 6.00am the water level was getting near the bivvy… It was time for a quick exit before the water topped the bank and filled the flood plain where I parked the van. It’s a long walk home if I lose the van. With zander fishing the Severn being called off I went to look at some potential eel waters on the way home. First I looked at a large gravel pit near Telford to see if I could find someone fishing and quiz them about eels in the pits around there. The pits were only built in 1983 but since I caught a 7.11 in a water built in 1991 I have started to look at waters I used to pass by. 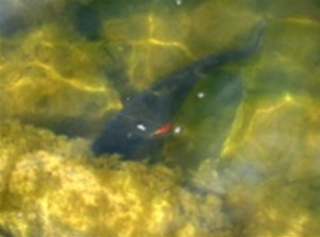 There was no-one around to ask but I spotted an interesting fish lurking behind a rock. It was the size of a carp but something seemed different… the bulging eye looked like a perch but the fish looked much bigger than a perch. The glare was making it difficult to spot and identify the fish. I spent ages watching the fish and eventually noticed a glint of red fin. The sun went in and I lost vision but when the sun eventually came out I was able to photo and identify it as a perch, the biggest perch I have ever seen. It looked at least 5lb and could even be a record …. It looked that big! ………………….. I will keep my eye on what happens there and try for a reduced price eel permit which has worked before…. I wouldn’t pay £375 to fish what is little more than a pond that’s for sure. Next stop was Dearnford trout fishery at Whitchurch. I was going to try and persuade the owner to let me eel fish, maybe even hire the lake for a weekend for an NAC fish-in. It looks awesome and only ever gets fly-fished but the owner is away on holiday. I was given a card with a phone number to try in two weeks’ time. I finally arrived back at home and spent the day sleeping and the evening working on a new slide show in preparation for the NAC 50th anniversary social event. I am scrapping the old slide show because nearly all the pictures in it are in the new book and I don’t want the slide show to be a repeat of the book. The new slide show will take a look at the variety of UK waters where eels can be caught with many never used before photos and then look at eeling in New Zealand and Australia and hopefully I will successfully manage to find time get some interesting stills from the extensive camcorder footage and add these to the slide show. I crossed the Severn at Shrewsbury and the levels were flooded almost to the top of the bank. I arrived at Spring Lea in the afternoon and went on Mallard and paid for 6 nights. I caught an eel weighing less than 1lb on ½ a dead perch but got no more runs that day or night. On Tuesday morning there was a red kite hovering over the pool. They have appeared here more often recently and it seems they are increasing their range and it will be interesting to see if they spread through the country like buzzards suddenly did about 15 years ago. Where I came from in the peak district never used to have buzzards – it has now! You never used to see them next to motorways - they nest there now! I would love to see the kites spread like that. I found a spool of 25lb Amnesia in my tackle box and binned it. I had seen a thread on the NAC forum regarding the stuff. Someone, I can’t remember who, had been let down by the stuff snapping. Nick Rose then said that he had been let down by Amnesia too. He suggested that the stuff probably deteriorates with age and since it has no sell by date on it the spool could have been in the warehouse/retail outlet for years and have already deteriorated by the time you put it on your reel. Like I said, I binned it. I had been using it for JS rigs but to be honest before buying the spool of Amnesia I always used to use the same line as the mainline I had on the reelat the time and I will go back to my old ways. I have just filled all my spools with 16lb Pro-clear and it looks tougher than the Amnesia to me and will do the job just fine. I prefer thicker, tougher stuff for my dysons so the rig will last longer. A dyson rig works fine with thinner line (.014” diameter) but you have to retie it after each eel. For many years I used some old floating fly fishing line on my dyson rigs. I am presently using Berkley Vanish 50lb fluorocarbon leader material (.026” diameter) and it can take some hammer. I blanked on mallard pool on Tuesday night and then on Wednesday I went on the kingfisher pool and caught three eels in 3 ½ hours. The first was under 1lb and very thin. The second eel was about 1lb but a nearby angler thought it was a 2lber. I weighed the third one which was much bigger and he was amazed that it was only 2lb 2oz ….. I wasn’t! The eel took the dyson rigged roach section three times before I caught it. Each time I missed the run I recast to the same spot and the eel would soon find the bait it had lost. They must swim to and fro looking for it. What was most interesting were the patches of bubbles erupting from the silt. The eel would run with the bait and then a patch of bubbles would appear where the eel had gone to ground with the bait. The water is very shallow and the silt is loose leaves. I have fished at venues like that before and been amazed to see huge patches of bubbles which I was sure must be eels going into the silt. The size of the patch of bubbles had me thinking the eels were monsters but today I could actually land the eels that were causing the patches of bubbles and the 2.02 left a massive patch of bubbles that you would have associated with a massive eel if I hadn’t caught the 2lb culprit. Luke the carpet-fitter phoned. He went back to the gravel pits and caught the other catfish. I was back on mallard pool trying a new corner. I have been baiting another corner with all my old baits as I like to put fresh bait on very regularly. It’s not the sort of place that I am used to becausethere’s no features – no snags and no deeps but I have found a few tree roots with an undercut bank. I will continue to bait it every night and then fish it on Friday. It’s one of those lucky dates - it’s my birthday on the 30th so from midnight on Friday I am hoping to be on a roll. The first time I got lucky on my birthday was many years ago when I had never caught a zander during daylight hours, only at night. It was the middle of the afternoon on my birthday, the weather was hot, bright and sunny when 2 rods went at once and I landed two zander a 7lber and an 8. There was a match on so I waited and then I went on after the match finished at 8.30pm. It was good to see an old face, Kenny from Oswestry, a jovial character that used to work at Morgans tackle. He won the match with 93lb, mostly carp. I moved in to the peg where he had won the match and he threw all his left over bait next to the weed raft where he had taken all the fish. The match winning peg with the weed raft I placed the bait next to. After Pete had gone I got the photo of the 7.11 that I caught on 12th June up on the laptop and then I compared it to the photo on the camera that Pete had just taken. Oh no! It’s the same eel! The distinctive black birth mark spot gives it away. Now that did my head in completely. 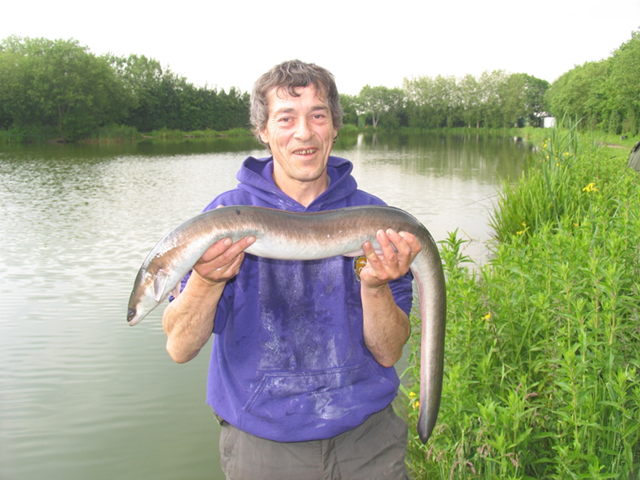 I had managed to catch the same eel just two weeks later from the other end of the lake. It’s time to move on. I am not into repeat captures so I have moved onto Orfe Pool for the last night of the trip. With other species repeat captures are quite common and acceptable therefore I suppose this eel counts for a Drennan cup award etc. but it’s not a capture I would wish to repeat and if the future of big eel angling is to be repeat captures in man-made commercial pools that are un-naturally overfed and overstocked then I would move on and pursue ferox and zander instead. 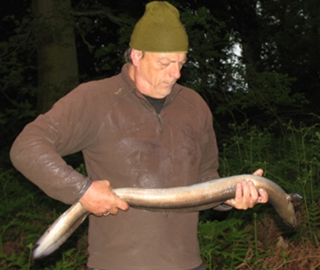 In the days before digital cameras repeat captures of eels were unheard of and so when John Sidley thought that perhaps once an eel has been caught it would never fall for an anglers bait again, eel anglers took it as gospel for a while. I remember Nick Rose (NAC) getting a repeat capture. He caught the same eel on a different bait at the other end of the lake near the outflow and he reckoned that it was maybe making its way out of the lake and wouldn’t have taken the same bait again. Then Steve Cotton (NAC) caught a 4lber in the canal and then caught the same eel a mile or two further along the canal. Slowly a picture of repeat captures was building. Then with the digital era Duncan Charman for the angling press did some excellent studies of his eels and zoomed in to take close-ups in macro mode of black spots and marks on the eel which I refer to as birth marks. He conclusively proved that repeat captures were occurring to him on a regular basis. It would be interesting to go back through my shoeboxes full of old photos and scan them to see if they can then be enlarged to identify birth marks. I must surely have had repeat captures. I am glad I didn’t know at the time I suppose because in future if I get a repeat capture it is time to move on. I am now on the Orfe Pool for the last night of my visit to Spring Lea and I won’t be fishing Mallard Pool again as I wouldn’t want to catch that eel again. “Muppet eel” a text just came through. It’s from Nick Duffy, who else could phrase it so well, the man has a talent. On the plus side it shows that my angling technique is on form and also that good handling countsfor a lot and the eel was still swimming around fit and healthy after being captured. On the lighter side Nick Rose had thought that his repeat capture eel only fell for his bait again because it was a different type of bait but my repeat capture fell for the same bait. I fooled it by changing the colour of my line because pink had blown on this water! And so to end an eventful month, it’s my birthday on 30th which is after midnight tonight and I am hoping for a lucky hit on this pool where there may be few if any eels as it’s further up the system. My gut feeling is that it’s a waste of time which is a bit of a dampener but two phrases that help drive me at times like this are “Nothing ventured: nothing gained” and “There’s always a chance when you have a line in the water”. ……………… I blanked………. And so……… on into July. It’s now official. It was the wettest April on record. It’s now May and still rain, rain, rain. A great crested grebe has lost its mate which had apparently hit overhead wires and been found dead. The male is sitting in the middle of the lake pining, calling, displaying. Perhaps it will eventually go if can’t find another mate. I swished several pregnant roach from among the weed. At 2.10pm I caught a daytime eel of 3lb 10oz on a large pregnant roach. I chose a swim with deep margins and sheer sides which I could drive the fish against.I gripped the landing net tightly and did an overhead swing so it landed on the surface at arms-length. I let it sink down to the bottom and then dragged it back towards me, keeping the net pressed to the bottom so no fish could sneak beneath it. I drew the net towards me through the deep margins and pulled the net flat against the sheer stansioned sides, so trapping all the fish. Result – nothing! I will try later after dark when the fish move into the margins. I tried another swim, a shallower swim with weed beds. I swished into the weedbeds. Bingo! I had swished about 20 fish and a net-full of weed. 3 or 4 of the fish are perfect large bait sized females oozing spawn. At 1.40am I caught another eel weighing about 1lb and was amazed that such a small eel had managed to take an over-sized bait. A heron is fighting with a coot on its nest. There is a heck of a commotion as the coot leapt in the air face to face with the heron. Each one stood its guard and the heron wouldn’t back off, at first but eventually after several minutes the heron flew away. I hear talk on the bank that the club is going to take 300lb of small fish out of the water. I was meeting Rob Lea for a night’s eel fishing and collecting some drawings he has done to go in my book. The man has got a talent. There is a canal at the top of the hill. Silvers might slip over the concrete wallon the canal and come down into the system. We wondered if any eels might slip over the spill way and make their way to the pool, stay there to grow on and then have the intelligence to retrace their way upstream to return to the canal rather than following their down-river migratory instincts. Thats the interesting thing with eels, they so often raise more unanswered questions. Next I went to Wardys, a water I’ve known about for several years and everyone always says “It’s too rough around there to night-fish alone you would never come back alive. I am absolutely certain that I have been rougher places so I went and fished it alone. I have no fear of the dark. 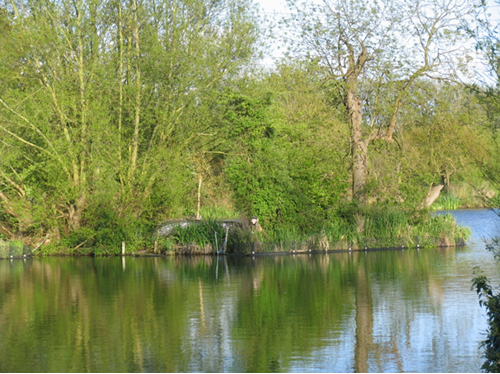 The pit is 44ft deep, owned by the council and is free fishing I fished my baits between 6 and 15ft contours and missed four eel runs, three on deadbait and one on lobworms. I suspect boots. I was at Wardy’s when an angler told me about two 5lb eels that were caught the previous week from a water in a wood just two bridges along the canal. Back at home google earth had revealed Monkmoor wood and a name The Sanna. I then found this reference on the web. I arrived at the Sanna to find that the levels were down and it was nearly empty after the recent droughts. 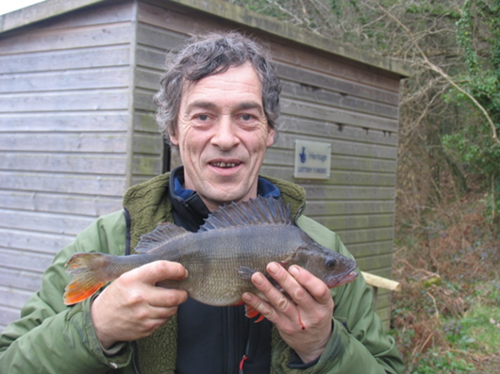 I soon caught three tench of 3-4lb and a few perch to 1lb 8oz. The surrounding land was quite busy. There were kids on scramble bike; kids with floating plugs casting into my swim; youths smoking skunkweed. All were quite chatty and helpful. I learnt the full history of the place - 38lb pike, 13lb bream, 9lb tench, 20lb carp. It went dark and lots of newts started leaving the lake and crawling up the bank. A police helicopter was hovering in the sky all night. At 2.00am a bright torch beam came from the woods, locked on to me, and two police officers appeared. They were searching for a missing vulnerable person. In the dark I was getting lots of skimmer bites on worm so I swished the margins and got 5 roach and 3 perch first chuck- all bait sized. I put a deadbait out on each rod and then caught lots of very small pike and a couple of perch as it got light. I moved on. The grebe was still looking for a mate. It was fanning its neck plumes and courting its own reflection. It called loudly to a duck and closed in on the duck all excited and calling loudly until the duck answered “Quack” after which it swam away all confused with its head down. The island is surrounded by a pontoon placed to protect it from onshore winds and allowing the island entanglement of willows and iris within the pontoon to replenish. To me this represents an eel holding area. Behind the pontoon is a heron. I once got fooled by the scarecrow on the other side of the island and thought we had a poacher on the island. 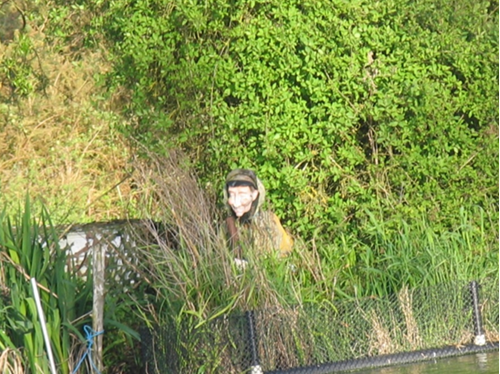 Closer investigation revealed a scarecrow put there to deter cormorants. I noticed that the club had put one of those plastic herons on the other side of the island. 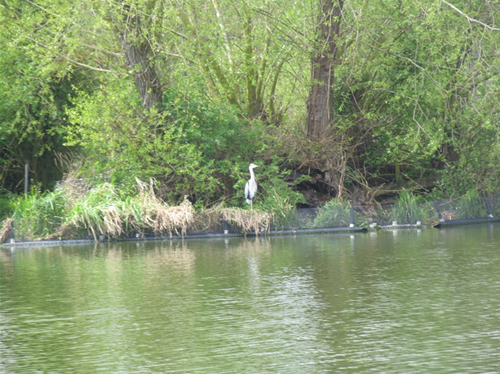 On this side of the island they had put a plastic heron, what a good idea I thought, it will deter herons from landing and they have been fighting with the coots and killing fledglings. Then the heron suddenly moved….. 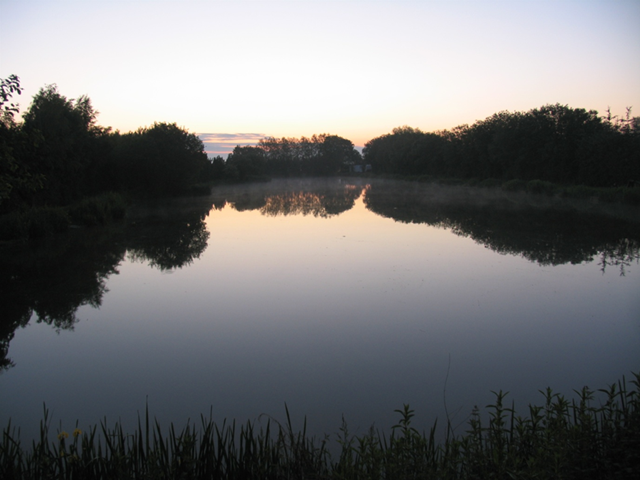 The first night I caught a 1lb eel at 4.00am on 2 lobs dysoned 2 rod lengths out just as dawn started to light the sky. 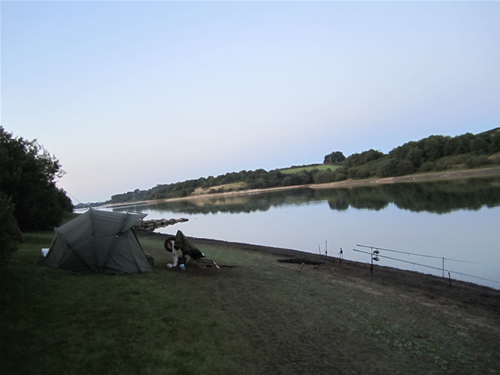 The following night I caught a 2lb 14 oz eel on three lobs dysoned to the right of the island and it seemed massive. It felt so big I was taking no chances and each time it lunged I gave a bit of line. I struggled to get it in the net before I remembered to boss it. I kept weighing the eel thinking the scales were on the blink. But no it was me that was on the blink anda bit rusty after a lay off. At 3.30am I caught a 4lb 7oz on a dead roach two rod lengths out. It seemed really huge. Again I struggled to get it in the net as I was on a stage over deep water. After such a fight I thought it would be bigger, but then again 4lb 7oz is a good eel. This helped me get my rusty eeling gauge in order for the season. It looked the right weight for its size and the season was starting to come together. The big baits were working. The following night was a blank. 34 acre local mere. I did two overnight sessions and caught a few perch to 2lb 8oz, a 7lb 8oz bream and a 7lb pike but no eels. It was very cold with hailstone storms. It actually snowed in Whitchurch ten miles away. In-between the night sessions I drove around looking at waters. 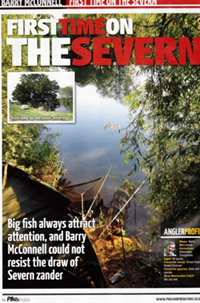 I looked at an old pool near Telford Last year; a carp angler told me his mate had caught a 7lb eel there. The internet revealed that the pool used to be connected to the canal many years ago and was cut off when new roads were built. The pool looked superb but it was very heavily fished with worn out banks and strictly no night fishing. I went to look at some interestingly large gravel pits beside the main road near Telford. Research revealed that they were only constructed in 1983 and though the waters look really good they seem a bit on the young side to be holding big eels, hopefully I am wrong and someone will catch one there. I read June’s copy of the Pike and Predator magazine. 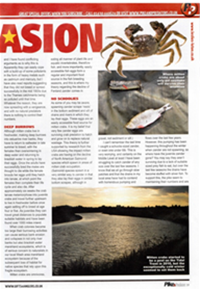 I find it appropriate that the following two articles are in the same magazine: First time on the Severn by me and Chinese Invasion by Steve Younger (about mitten crabs). The reason I have stopped zander fishing on the fens and moved on to the Severn is because I can’t catch any zander from the Relief Channel anymore. I spent a glorious ten years on the channel where everything went right and I enjoyed some awesome zander fishing. The fishing declined around 2004 and I spent a few more years fishing it for just one zander which I caught twice, two sea trout and hundreds of mitten crabs. I caught the first mitten crab in 2003 and several more in 2004. 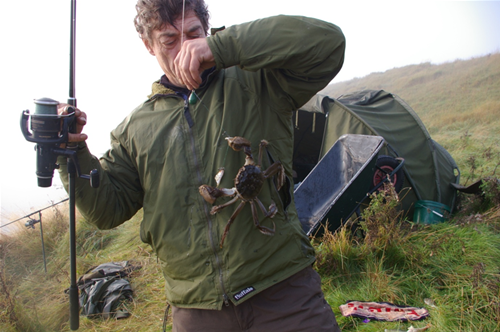 By 2006 it was unfishable on deadbaits at night and there wasn’t a zander in sight, the mitten crabs had also colonised the Middle Level by now which was the other water I fished when the channel got too rough. Here is an extract from Steve Younger’s article. I think that Steve has got it spot on and I agree with him entirely. I had realised that the zander had declined as the mitten crabs population rose but I couldn’t quite work out how, especially since the pike, bream, roach etc. seemed unaffected but Steve points out that they adhere their spawn to weed and don’t lay it on the bottom like zander. There are so many crabs in the system that a nest of zander spawn probably wouldn’t last an hour after dark it certainly wouldn’t survive the night, my dead-baits don’t. What I can tell you is the best way to deal with a mitten crab and really deal out some revenge. 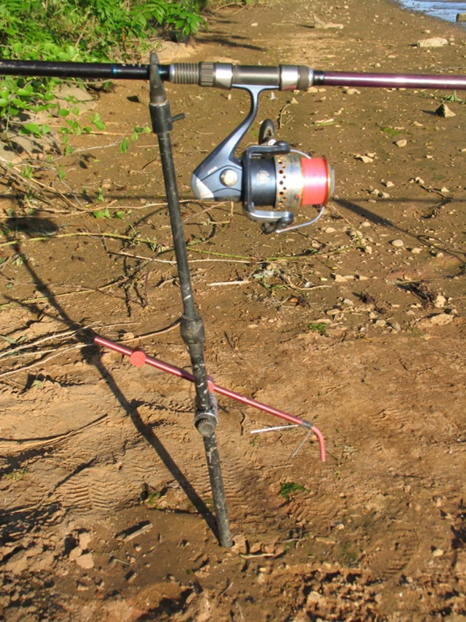 If you dangle one in the air on the end of your line, one sharp kick with your boot will instantly shatter it into mushy liquid soup. Liquidised crab kicking is fast becoming a new sport on the fens. My passion for the fens is so strong that I was reluctant to call it a day and move on. Eventually and reluctantly I had to admit that it was a waste of time. That last sad day with a lump in my throat I drove away from the place that had served me the best days of my life. I drove past Alf’s bungalow which still had the zander weather-vane on top and then the site where Beaver’s old tumbledown cottage used to be near the Relief Channel. Father and son, two good friends of mine who both sadly died soon after the mitten crabs arrived. It was the end of an era. The fens will be a hard act to follow. 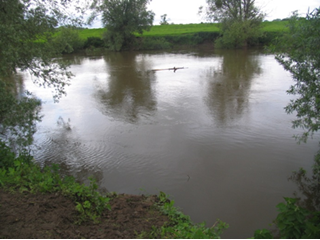 I tested the waters of the Severn last year and this year I intend to have a bigger innings. It will never replace the fens with its awesome package of flat landscape, big sky, hospitable people, open space and freedom but the zander fishing on the Severn is better than on the fens so I’m having some this season - while it lasts! One lesson I have learned is that nothing lasts forever. 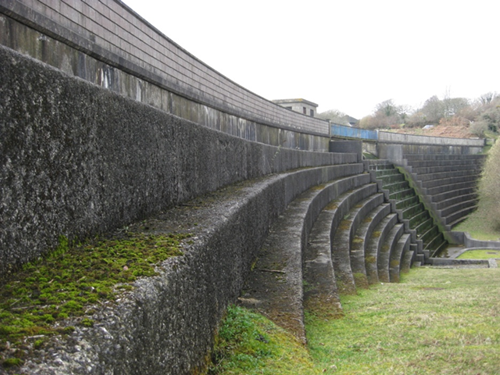 A venue or a species will have peaks and troughs. This year I intend to climb a peak. I have joined in with weekend night fishing trials with KinverFreeliners. The water is new to the club. I arrived at 4.00pm to find it is limited access and a long walk to the swim. I can’t see any anglers so I set up just past the sailing club. I later found out that this is the match length. I notice swirling, boiling water in front of the sailing club and a strong current pushing through the match length. It turns out that the water is pumped into the reservoir, stored in the reservoir and then discharged via The Hampton Loade Treatment Works. The water is sent via the well-known ‘blue pipe’ bridge over the River Severn to be treated and then it is sent onto the surrounding Midlands towns. So the water is pumped in and pumped out. 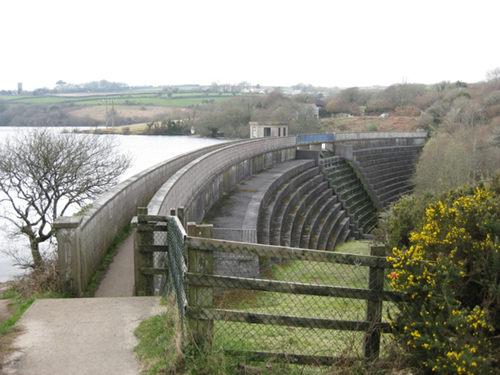 There is no access for eels by the normal process of climbing in through the outflow or around the dam. The only eels to get into the reservoir have been pumped in. 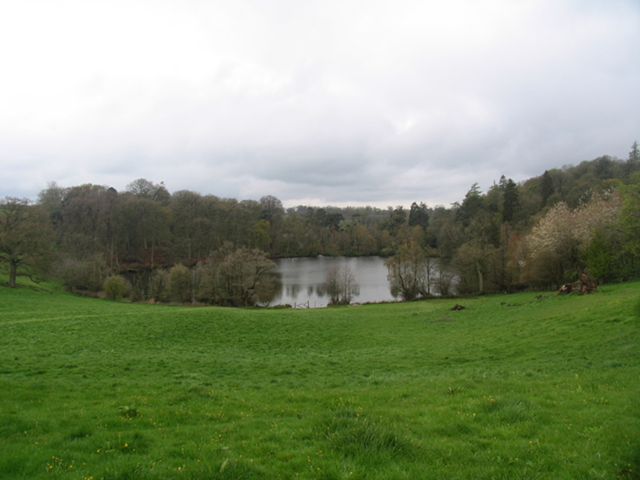 I am told that the reservoir holds chub and barbel that have also been pumped in from the river. A bit of digging unearthed stories from the 1970’s of 4lb eels and a 7lber caught by pike anglers. There were also stories of eels stuck in the discharge valve at the point of no return after they have dropped down the discharge tower. The first night, first fish was a chub of nearly 5lb, followed by a bream of about 6lb and a couple of 1lb perch. No eel runs. It rained all night. My bivvy was away for repair and the brolly with overwrap leaked. Lucky I’m used to it or I would have gone home. 2nd day - 2lb 4oz perch and several 4lb bream. No eel runs. Pete came to my bivvy in the middle of the night with one of his amusing hybrids. “It’s a chub roach hybrid” he declared. “That’s a roach” I answered. I should have taken a photo. No eels were caught but we would be back again next weekend. The Montgomery canal, Welshpool I was offered a complementary ticket to fish the Monty. 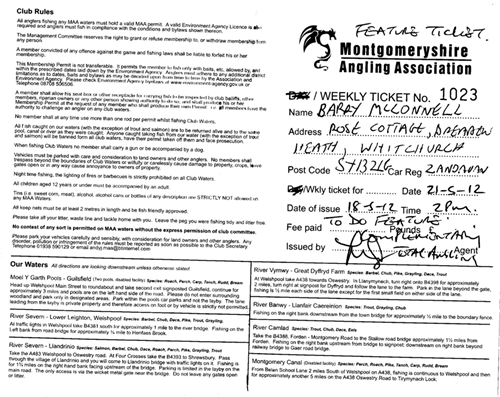 Dean at Total Angling wrote out a weekly ticket and put on it ‘To do a feature.’ This entitled me to fish the canal 3 ½ miles either side of Welshpool. I found a little bit of info on the net. “Excellent fishing is to be found on the ‘Monty’. 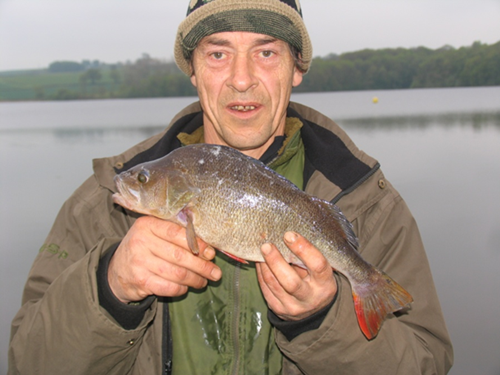 On most stretches, you will find a broad selection of species including large Tench , Perch , Pike , Roach and Bream. 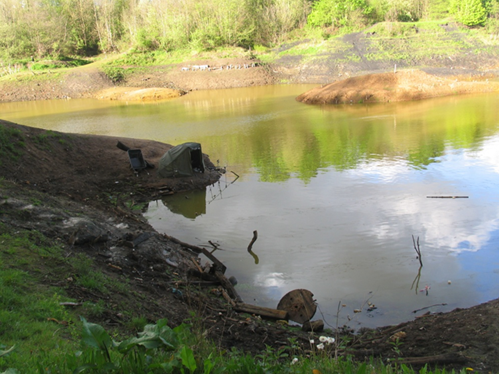 Also, on the restored northern section, you will find Carp, Dace, Rudd and Crucian Carp. 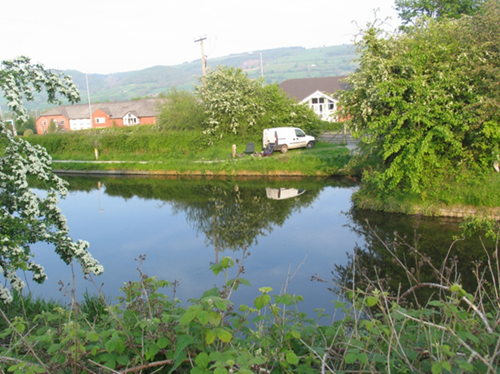 On the Welsh Section, the Montgomery Angling Association lease the fishing rights on the canal between Tirymynach (near Bank Lock Bridge 109) and School Lane, Belan (Bridge 123)." I spent 4 ½ hours driving around looking at different sections. 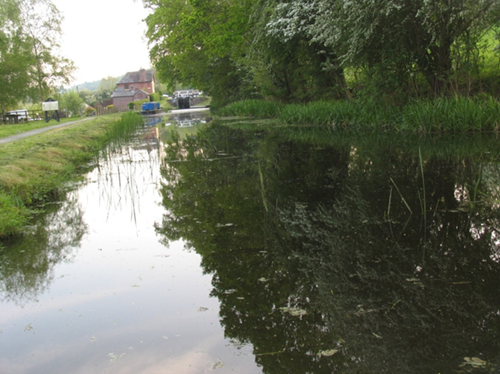 In the non-navigable sections the water was clear, shallow and weedy. Around the town centre the canal was navigable. Here the water was coloured with less weed. There were some interesting swims such as the mooring area but the towpath was generally too narrow to put a bedchair or bivvy on. I ended up fishing the north side of the interchange. Here the canal was rerouted through a short tunnel when the new bypass was constructed. No towpath was provided with the construction and the towpath leaves the canal and goes up, over and across the road at this point. As I was setting up a bloke came along wearing a shirt saying British Waterways Montgomery Canal. 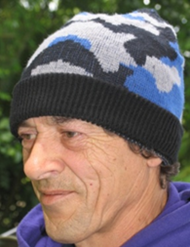 He worked as a volunteer and had a vast knowledge of the canal. I asked him about a section of the Monty canal I had once fished and found it lined with a butyl liner. He explained that this section was never lined when the canal was constructed because the underlying ground was a saturated peat bog. The canal had breached and the repair wasn’t carried out for many years leaving this section of canal dry. The underlying peat dried out and shrank. By the time they came to restore the canal this section had dropped nearly two feet lower than the rest of the canal and they had to put the liner in. I caught pike and perch but no eels. 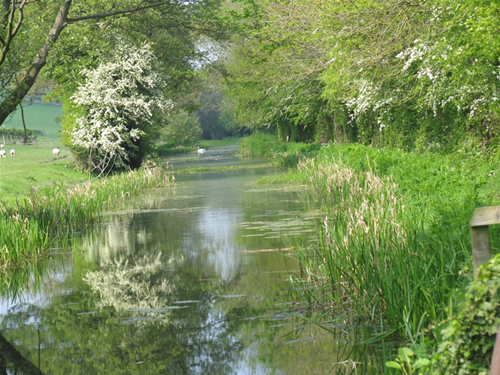 The following night I headed for Belan locks as I had been told that this is the deepest section of canal and local anglers I met told stories of losing big eels there. It was supposed to be deep but to me it seemed shallow, almost too shallow to use a dyson rig. The bottom was covered in blanket weed so I didn’t fancy fishing my bait on the bottom. I shortened the tail on the dyson rig and though I could see the float just below the surface I wasn’t bothered because I have caught plenty of eels in water as shallow as this and would be fully confident once it went dark. Soon after dark at 11.00pm I caught a small eel of barely 1lb on dysoned lobs. I also caught pike, perch and an odd looking roach bream type hybridwhich looked decidedly welsh. The following day I drove out into the hills to Bishops Castle and visited Denzil at Willis Worms where I collected lobworms and Dendrabaenia. I gave him a copy of a cartoon by Jason Morgan that he has done for my book. It is now posted on the noticeboard at Willis Worms. 34 acre Local mere.I did a short overnight session on an odd swim and hooked an eel at 11.45pm. 3 lobsdysoned. “Bleep…bleep, bleep the Rollover slowly, then steadily, lifted and flipped off as an eel pulled the bait down to the bottom. No run commenced so I tightened down and struck. Bump, bump, bump. I had a good eel on, a heavy fish and then it was suddenly gone. We rarely catch an eel below 3lb in here and this felt a good fish so I was gutted. The strange thing was that I got the bait of three lobs back intact and I couldn’t detect any damage to them. I have been scratching my head about this and the only answer I can come up with is that the eel may have become entwined in the trace, the mainline and the dyson rig - extension, float and rotten bottom. I once landed an eel that wasn’t hooked but it had twisted itself until it was completely wrapped-up in the line. I didn’t unhook the eel - I unwrapped it! 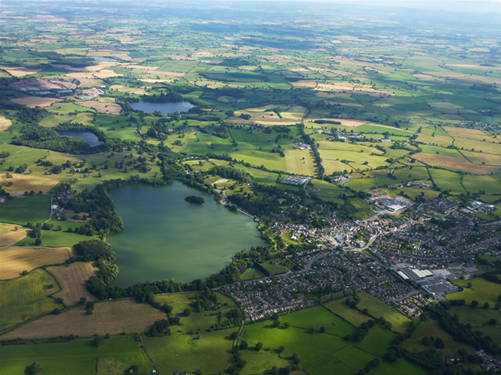 I was up and away in the morning and drove straight to the 100 acre Chelmarsh Reservoir. The baits had deteriorated in the warm weather and I didn’t fancy using them. There was a way out of this no dead-baits situation that has paid off before. One of the umpteen perch I had caught was deep hooked and it died. The guts went on one hook; the gill-rakers on the another and a bit of the softer darker flesh from its back went on the other hook with the perch’s two eyes for stops.I missed an eel run on the gill-rakers and caught a bream on the guts. 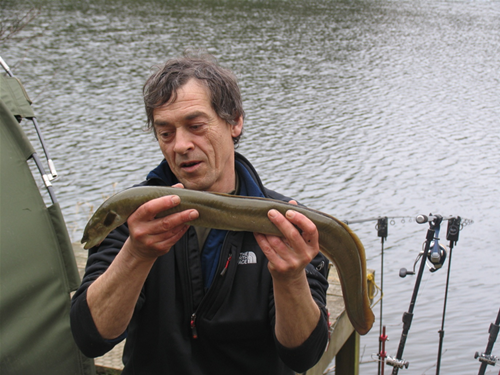 The result of the weekend was a 3lb 10oz eel caught by Pete Drabble. The first one we have caught from the water. Also Dean lost a good eel at the net. I am looking forward to the next weekend of night fishing trials. 27, 28 and 29th May. A text to the club secretary books me on to the 114 acre mere in the new the bay for three nights. It is a nice open swim facing north and looking over the vast sheet of water. The first night I got no runs but I got a liner from an otter at dawn. It was playing in the margins, thrashing about near my rods and it swam away with my line draped around its neck.This was the only time my indicators had moved. The following evening the wind was blowing clods of algae and loose rafts of silkweed straight at me and weed was riding up the line. I tried to swill it out of the way with my feet but it kept regrouping around my line so I lifted it out by the handful. My mistake! Ouch, something like a wasp sting! I threw the weed down and looked at my hand something was still clinging, kind of stuck onto it.“Uuugh” a strange strangled kind of noise erupted from me as I brushed off the alien. I don’t know what it was – something mottled brown, black and flat and clinging to me. Maybe it was a leech or a water scorpion? It wasn’t like anything I had encountered before and I was too freaked to identify it properly and it felt more like powerful sting than a bite. I cleaned the wound with fresh water (and not with a handful of weed!) and bathed it in saliva as an antiseptic.The following two night produced no action and the only thing that stirred my indicators was weed clods. The nights were rowdy though because I was next to a heronry and the young herons in the nest were croaking for food all night, I was also near to a fox’s earth and the cubs were screaming and mock fighting all night, closer to the bivvy there were rats all over the bankand I found this funny because the chairman of the angling club is a professional rat trapper and he fishes this swim sometimes. 30th & 31st May & June 1st. I am booked onto a local 4 acre mere for three nights. Many years ago I used to fish here in a boat but these days there is limited bank fishing allowed. It is a hard and challenging water where I usually blank but I have caught 4 eels there (2 on the first night I ever fished it). I think it may produce something big one time. In April I noticed one or two quarries on the OS map and headed down to Cornwall. I went two days ahead of Pete and he followed on in his van. The plan was to do an overnight recce to a different venue each night to explore odd and unusual waters and then retreat to the vans in daylight to sleep.We had packed a light kit for the job consisting oflarge rucksacks, five piece travel rods and angling day-session shelters that pack down in to short lengths. We took no bank sticks just 999 alarms that attach to the rod. Everything fits in the rucksack and we look like hikers wandering around with no rod-bag, bivvy or umbrella. I must get a badge saying ‘Hikers Club’ it may make life a bit easier when asserting the right to roam. 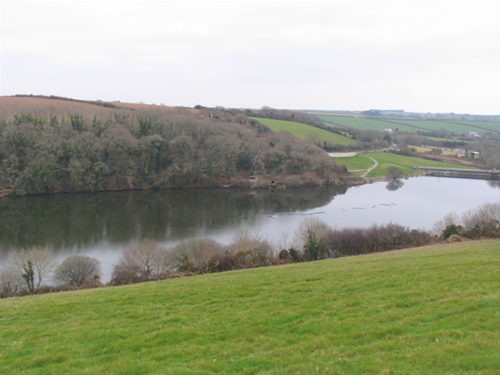 Our first stop was Cornwall's largest natural lakewhich was formed when a shingle bar blocked the mouth of the river and rising sea levels formed a barrier beach.The big pool by the sea is dead cert for an eel and I had (up until this trip) never blanked there. Even in the depths of winter I average a run an hour on an 8 hour session. Rain, rain rain.This time we got just one run from a trout on sand-eel section and we didn’t get any eel runs on 6 rods between us on the ‘dead certs for a run’ water. That night I was exchanging texts with Ashy who was out eeling in Scotland and Lee in midlands and Camo in the South West. Rob, Darren and Steve were also out in different regions. None of us had anything, weird but true. Maybe no one caught an eel anywhere that night in the entire country. It happens like that with zander so why not eels? Questions, questions …. Eeling always raise them. There are several quarries above Argal Reservoir. The outflow of some of the quarries goes into ‘no-eels’ Argal but others flow the other way to the sea. 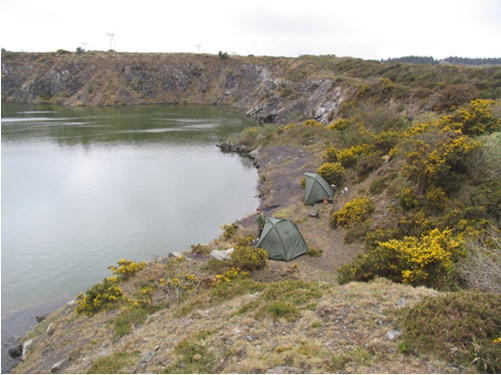 At the first three quarries we found one residential bungalow and two caravans. People were living in these quarries which looked awesome but very enclosed and private. So much so that it didn’t feel right to intrude. We went to try to find one behind a farm. The farmer was busy and said “No fishing for eels. I am into conservation.” “So are we” I replied “We put all the eels back alive and care for them.” As he leaned in through the window of Pete’s van he noticed two fluffy soft toy eels on the dash board. They were nose to nose as though kissing and seemed to represent our love of eels “Look at those two eels. You can see that you mean no harm to them” he said “Come back and see me when I’m not busy. I’m hectic today”. I haven’t even seen the farmers’ quarry pool yet but reckon I will return as he suggested and have a look then. Three quarries later we found one that looked suitably fishable and fishy. Are there any eels? There is a stream flowing out and the sea isn’t far away. It looks as though no one has ever fished it. No signs of fish. No floats, spinners or line hanging from the trees. If the owner comes we may get permission.It started to rain again - rain rain rain. …… I went to the van, five minutes I was gone and Pete missed the one and only run of the session, on my rod, on sand eel. I must return when it’s warmer the prospects look good and unexplored. 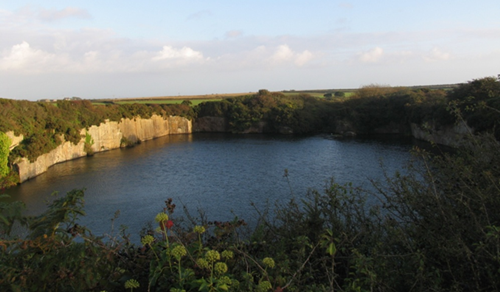 The other quarry we went to was near Newlyn. I found this venue last September and gained permission to fish. The outflow soaks away underground and I haven’t got enough confidence of there being any eels in there to do a proper stint. I did one night there and got no runs. This time we decided to move on and perhaps fish it again when the weather has warmed. The rain continued as we headed for College reservoir which is officially closed to fishing. Local carp anglers are fishing it ‘on the quiet’. I have been fishing the area long enough to hear about the local thing and I can do ‘on the quiet’. So we went on too. ….Rain, rain, rain. It was the wettest April on record. The day shelter is only shower proof and since this was more than a shower the rain came straight through. I had no bed-chair, the ground was a puddle and the groundsheet was awash. Everything waswet, the bedding and all. I went to see Pete. “Uummmm- no - not really”. There does come a point where you have to know when to quit so we aborted the mission. 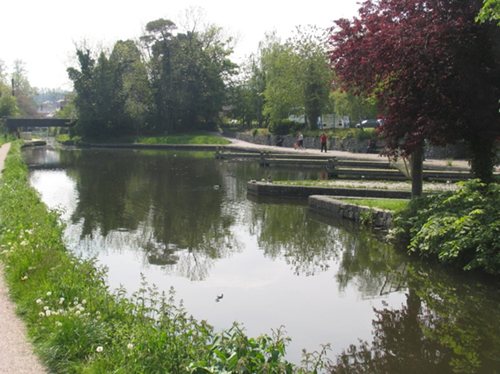 We drove to the lorry park across the road from Helston park boating lake where we walked around the lake and spotted eels bubbling clearly illuminated by the street lights; you can even spot eels here in the daytime. We had lost spirit with the drenching and slept in the vans instead of fishing. 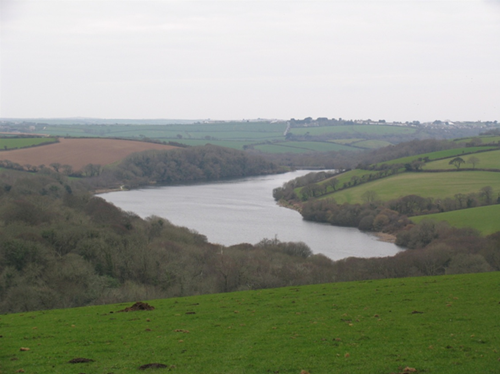 In the morning instead of looking at some waters we had earmarked in lower Devon we headed for home. It took days to dry everything. Another wet-weather session at ‘The Wulfpit’, a club water that holds a massive head of baitfish. A recent netting survey caught so many fish the club was advised to take some out. It is a match orientated club and they were reluctant to follow this advice. There are no pike. It must be heaven for the eels being the top predator here. I have had some success using pregnant dead baits oozing with spawn at this time of year. I think the eels prey on pregnant females rather than males so I am careful to select a fat pregnant fish for deadbait. I chose a massive bait, fat and pregnant. If you stop to think about it the choice is obvious sense. A feeding eel could expend energy by catching lots of little fish or look for a bigger target, one that stands out in the crowd, one that weighs as much as 15 or 20 of the many 3 inch (bait sized?) roach that abound here. I got just the one run at 2.20am. Bleep… bleep… the Rollover flipped off and line slowly trundled out. I struck and felt an eel -thump, thump, thump.I bent into the fish until the rod was in a full curve and I was able to move the eel towards me. The fact that I could move the eel surprised me as such a big bait had fired up my expectations and I was hoping for a monster. I soon netted the eel. It weighed about 2lb 8oz. I sacked the eel and went to the van for my waders as the bank was getting a bit messy in the rain. “Wagh!”Deano leapt off his bed-chair, shot out of the bivvy and nearly went into the lake. In the morning I got the eel sack out on the bank and showed Dean the eel. “So there are eels in here” he said as he’dnot caught an eel from this venue yet despite doing many sessions. I wound in one of my rods. He looked at the size of the bait and said “Blooming heck. That big? 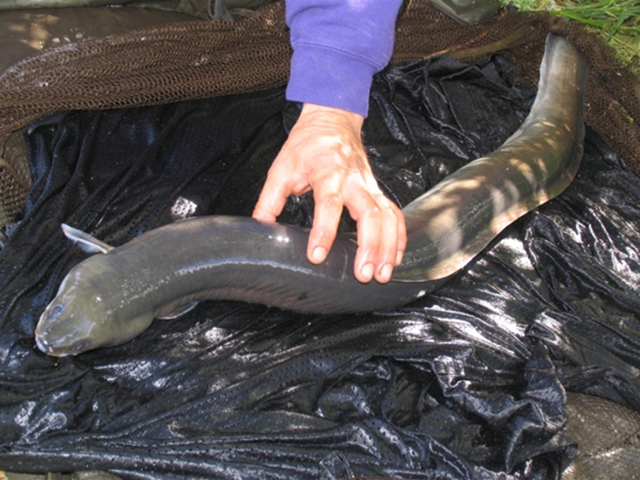 It’s massive, for eels?” I put two fingers together and laid them alongside the baits’ body. The humped back and dorsal area stuck out beyond the two fingers but apart from this area the main body of the baitfish was the width of two fingers. I put my fingers next to the eel’s mouth and it was just about the same width as my two fingers. We discussed the fact that the eel could eat such a large bait and reckoned that the eel crushes and compacts the body of the bait as it swallows it. So to conclude; I caught an eel on a massive bait when all the smaller baits were ignored - Selective feeding! ‘The Wulfpit’. Rain, rain, rain. A big pregnant bait on each rod. Blank. No runs. 114 acre local mere A text to the angling club secretary and I’ve booked myself onto somewhere special for 3 days & nights. A never been fished bay in a mere that has just opened for bank angling this year. The land belongs to a large stately type home with splendid landscaped grounds and a massive walled garden with towers, turrets and an old boathouse. I’m tucked away in the field next to the boathouse. I’ve only brought worms as it’s easy to catch baits here. 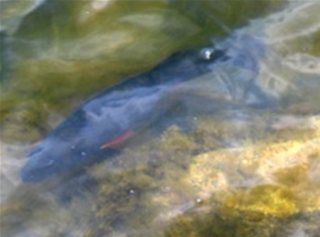 The shoals of small baitfish hide in the shallows during daylight hours when cormorants and grebes abound. The diving birds can’t get them because the water is too shallow. Today I was in for a disappointment. Rain, rain, rain. It hasn’t stopped raining for days and the levels have risen in front of my eyes. The margins are now deep, too deep for the small fish to seek sanctuary from the divers. There is not a fish in sight. Rain, rain, rain. There’s a puddle in the bivvy. I get a roll of kitchen towel, break a sheet off and soak up the puddle. …. Ten sheets later I realised the puddle is still the same size. There’s a hole in the groundsheet. I’m bivvied in a hollow filled with a puddle. I must patch the groundsheet when I’m back at home base. Rain, rain, rain. Swallows are flitting all over the lake – feeding! Hatching mosquitoes! The rain hasn’t stopped all day and the mozzies are hatching. Why do mosquitoes hatch in the rain? Do they always hatch when it rains at this time of year? Or are they hatching because its warmer and nothing to do with the rain, questions, questions. I made a note to research on Google. The swallows haven’t stopped feeding all day. I watch and make a note of their preferred feeding area. This could be where the bloodworm populations are. Back at home base I checked out mosquitoes on the web but couldn’t find any reference to rainfall and its relation to their hatching. There was a mention of them preferring to hatch when predators are at the lowest incidence. This reminded me of a night I once spent sheltering from a sudden heavy shower in a boathouse. The boathouse was full of bats clinging to the roof as they had also got caught out by the sudden torrential downpour. Bats eat mosquitoes but they do hunt when it’s raining and its only exceptionally heavy rain that sends then running for shelter. I will keep on watching the mozzies and probably come up with more questions and few answers. After a long hard winter stuck indoors writing a bookit’s time for an eeling trip toCornwallwith Pete Drabble. Our first stop was the Newtown Angling shop where we got some razor fish and cuttle fish - all live. Pete did a couple of nights on Marazion Angling Club’s St Erth fishery while I visited the grandchildren. He blanked and found out it had been recently drained, netted and was becoming more like a commercial fishery and not our kind of place. The next stop was Argal Reservoir – 65 acres.Self-service 24 hour permits are available onsite from South West Lakes Trust Fisheries. Verdict. 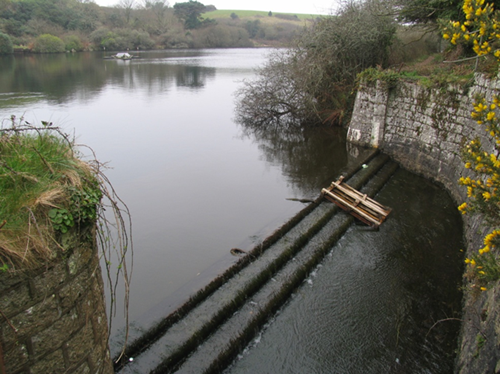 An impassable dam prohibits eel access and the eels in the reservoir have been stocked. On this session in March 2012 we did three nights before I declared “I am definitely not fishing Argal again and I mean it, (I hope! )” Chasing stocked eels is not my way. They could have all gone over the outflow by now and there could be no eels left in the reservoir. We moved on to look at other waters. First we looked at the tidal pools beside St Erth estuary behind Jewsonsthe builder’s merchants. We wondered about eel fishing for freshwater eels in the sea. Last time I went sea fishing from the shore at the Menai Straits the first fish I caught was a freshwater eel. “You would catch one out of a puddle” was the general opinion of our sea angling party. 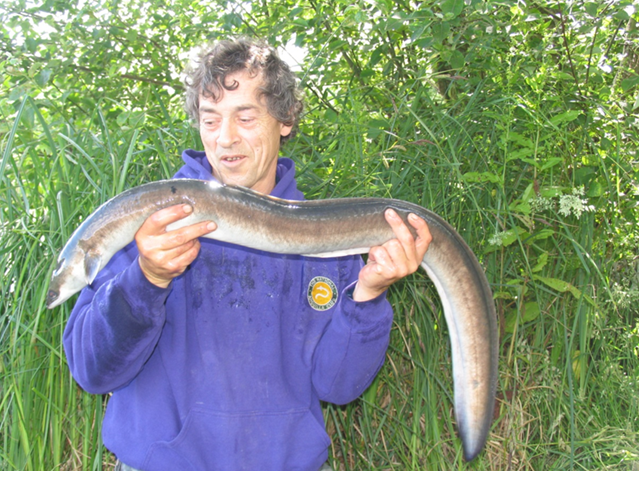 I do wonder what the record freshwater eel caught from the sea could be. Has anyone had a 4, 5 or 6lb eel by design from the open seas and coastal waters rather than estuaries? Is it worth a go or is it madness? Next we looked at Woon Smith, a recently abandoned small water which used to be run by the now disbanded St Ives Angling club who have given up on the water. The current situation is to pay at the farm and no night fishing, so I had heard. I knocked on the farmhouse door intending to try and persuade the farmer to let us night fish but no-one was in and the fishery looked neglected. Bussow Reservoir was only a short distance away so we went there for the night. First we bought permits which have to be bought in advance from a newsagent’s in St Ives. 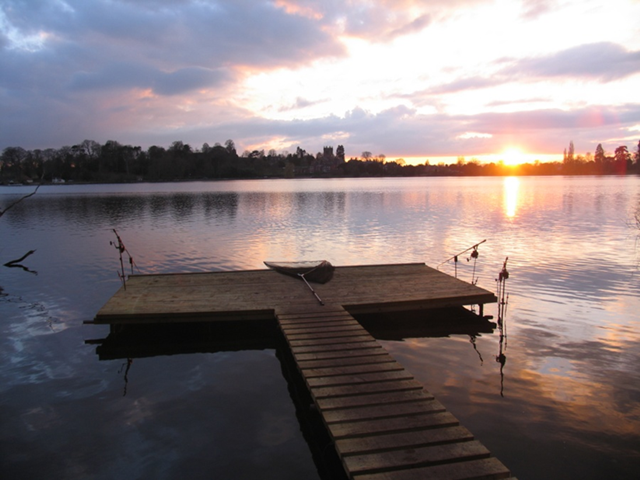 This Is another South West Lakes Trust fishery but there is no facility for self-service permits at this venue. We met a few familiar carp angling faces and caught no eels. I was still using the razor fish which were still alive. They keep well wrapped in newspaperand they madea superb bait, the bream loved them. They are a suitably large sized sized shellfish and make a good eel bait. The cuttlefish were also superb and Pete caught carp and bream on them at St Erth fishery. We were up and away the next day to look at Sharkeys place. I had heard rumours that this little commercial fishery near Hayle had been up for sale as Sharky had died a few years ago. I fished this little commercial when it was first dug out and constructed nearly thirty years ago. It did a 1lb eel the first week it opened to anglers and Sharky reckoned they had got in from the brook. And now nearly 30 years later it seemed worth a look.It is now fenced off and gated. We climbed the gate and walked around the lake which was covered in lily pads, quiet, peaceful, neglected and private. I may return and hope to find someone there to ask if I may fish. Next we did a bit of map reading to find our way to a couple of small, wild, overgrown moorland ponds. There was a sign up saying that planning permission had been applied for to turn the site in to A Course Fishery and holiday complex with several log cabins on site. It amused me that they had spelt coarse wrong but the holiday complex theme didn’t seem at all amusing. The ponds seemed a bit small, acidic and full of stunted fish. They didn’t seem to be big-fish waters and we didn’t fancy a go at either venue so we headed north. Our next stop was Porth Reservoir. 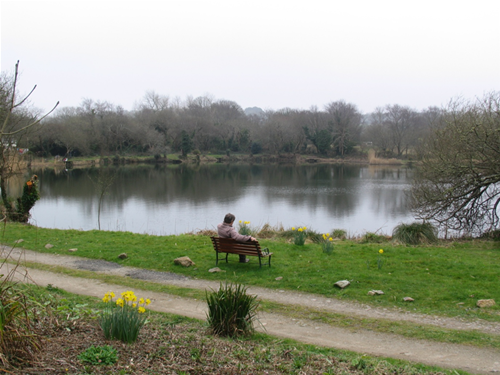 PorthReservoir is another of SW Lakes Trust fisheries. Open to anyone and everyone, it holds no secrets. The permits are self-service onsite where you put money in the envelope. I remember it being run as a trout fishery in the 70’s. Set up near the bird hide and the bank was rocky so the bank-sticks ended up going in at odd angles. They were in safe, sound and secure but at angles, not at all uniform and pod-like. 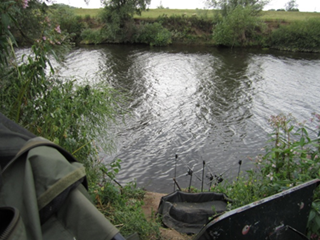 The black void of my open bivvy door can be seen on the far bank beside the bird hide. You wouldn’t see it so easily if I closed the door. A 2lb perch fell for a mackerel fillet. A 2lbeel from Porth Reservoir Note the irregular angled banksticks in the background.. I soon encountered the local expert who said “Scuseme mate you’re going to get your rod dragged in. Look at your rods, they don’t look secure - you don’t know how to fish properly.” I could hear Pete sniggering in the next swim as I corrected the intruder by starting with “You must be a carp angler then” after which I had my sport as I’ve caught a lot more big carp than him to over 30lb - on eel baits with a wire trace! The guy could hold his own and referred to my reels as “little match reels” trying to imply that they were inferior. Here is some info on these reels. “See you later Mr Big-Pit” was my parting comment to the carp expert. I had only recently bought these reels after deciding to stop using bait-runners and hey-ho, so far, line twist is a thing of the past. I have Mark Salt to thank for putting me on to these reels. He had bought some and he told me that they are so precision engineered that they should last almost forever and he should never need to replace them. As small and light as they are, the lip on the spool is the same diameter as my discarded Shimano baitrunners. The ABU Garcia Soron should outlast me and is a joy to use unlike big, heavy, clunking big-pit reels. The three nights at Porth produced two small 1– 2lb eels to Pete and I caught a 2lb 2oz on a mackerel fillet and a pounder on a sand-eel section. Plus the usual nuisance fish bothered us on our mackerel and sand-eel baits and we caught sheds-full of bream, perch to 2lb and pike. We returned home on the 17th of March as I had to write the last chapter and do some serious editing of a book I’ve been writing for the last 17 months. I decided to do three nights locally on a 114 acre mere and use the bivvy as an office todo some work using a laptop. I caught one small eel of 1lb 6oz on half a gudgeon. Despite the small size of the eel it still felt like a good result as it’s only the 4th eel I have ever caught from this puzzlinglydifficult venue and all have been small ones.. 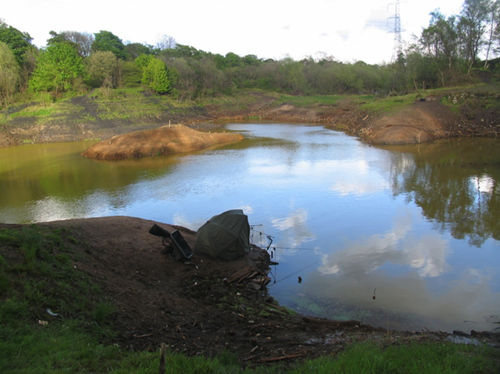 I did one night on another mystery for eels water, alocal gravelpit- Tudor Griffiths gravel pit. This venue ‘probably’ doesn’t have any eels in and surprise, surprise…. I blanked that night! Pete and I went to fish a commercial fishery complex that has never been eel-fished or night fished. Spring Lea Fishery near Shrewsbury.I gained permission to night-fish the venue for eels and phoned around a few NAC members but no one could make it at such short notice so just Pete and I went along. We had been told the usual stories of massive eels that the match anglers can’t land. I caught 4 eels to 2lb 6oz on dysoned deadbait sections and Pete caught one or two. We wondered if the match anglers could land a 2lb 8oz eel. It would be one heck of a tug of war with an elasticated pole and we guessed that they probably wouldn’t be able to get such an eel in and reports of huge eels would filter through to me yet again.